The intrepid Thea Stilton is Geronimo’s sister, and she is no ‘fraidy mouse! She travels the world in search of great stories to report for the Rodent’s Gazette, but this time the adventure is making new friends by visiting you! The wearer of the Thea Stilton costume should be 5’4” to 5’9” and be of average build (US women’s size 8). 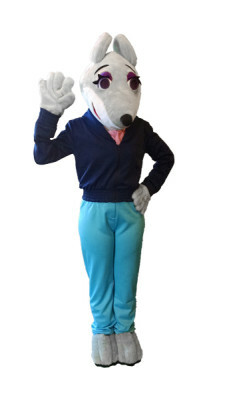 The rental fee for the Thea Stilton costume has been graciously provided by the publisher Scholastic Trade for promotional use only at schools, libraries, and bookstores. The only cost to you is Second-Day Air shipping arranged by Costume Specialists to send the costume to its next event, which is only $60.00. Visit www.scholastic.com/GeronimoStilton for more fabumouse fun, including excerpts and games!